SoGoSurvey’s online survey software was designed to make the survey process easy and efficient. 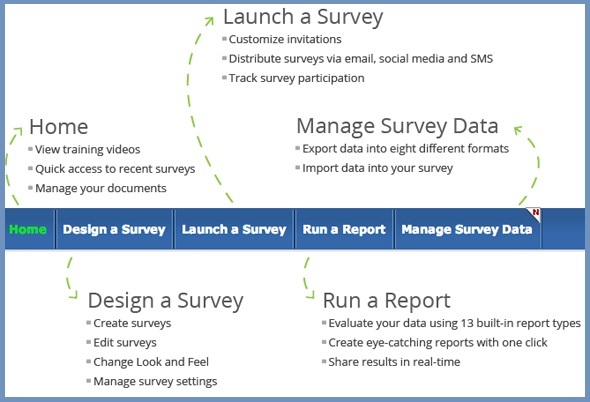 But, while designing, launching and analyzing form the core of this process,our platform was built with power and flexibility so you can do more with your surveys. Whether you choose a pre-designed template, or create your surveys from scratch, our highly-customizable platform allows you change colors, add columns and insert logos to brand your look and feel.You can also choose from a wide variety of question types to create simple or complex surveys. Create branded invitations that are sure to grab attention and easily reach your participants— via email, social media, even SMS. You can also allow your participants to forward your invitation to 10 of their contacts in order to further extend your reach. Evaluate your data using 13 different report types. Our advanced reports allow you to drill even deeper into your data to spot important trends. Then — with just one click — turn your data into eye-catching presentations that will impress your colleagues, co-workers and higher-ups. Our platform not only makes the survey process easier, it also has built-in features such as Rules & Alerts and Advanced Branching that let your surveys build relationships with your respondents. With Rules & Alerts, you can also set specific conditions and receive immediate alerts when those conditions are met. And Advanced Branching routes respondents around irrelevant questions to create a personalized survey experience. With the rapid advances in technology, consumers expect more personal and substantive interactions. It’s no longer enough to simply treat people as data. SoGoSurvey has not only made the survey process easier and more efficient, we have also created online survey software capable of moving beyond surveys to build loyalty and trust. In today’s modern survey environment,your participants expect nothing less.